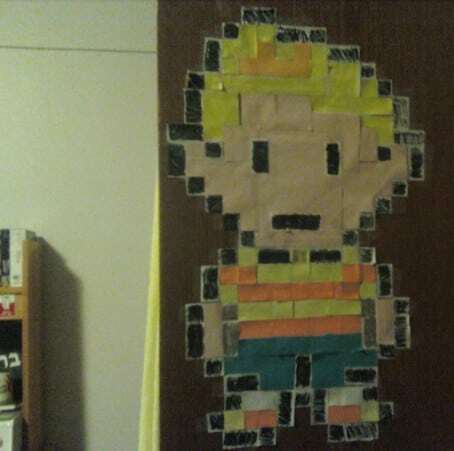 It’s Lucas, made out of a bunch of mini post-it notes. The black edge ones were white post-its covered in black ink. Awesome. I should do that or something similar for a sticker grid. I made a point of only using whatever actual post-it colors I could get my hands on (so no black), and I think it turned out pretty well, considering. In retrospect, though, I probably should’ve simply forgotten about trying to make his cheeks a different color and just used that pink for his entire body. Why did you specify the notes on the outside? Are they different post-its from the ones on the inside? I’m guessing because the other ones were un-altered. This is so cool. This get’s 10/10 points. That must’ve taken forever, but it’s worth it. Wow…. somebody sure has a lot of time on their hands. More like a lot of awesomeness. I wish I had thought of that a decade or so ago. I would have made a Ness as well as some other characters from other games, definitely a Mega Man. But now I’m too old for that shtuff. The only thing missing is the rosy cheeks. But it’s pretty awesome. Kinda makes me want to try something like that. Oh man. I’m so making one of these on my door. Ugh, i’d love to make a Ness or Lucas or, *drools* Masked Man, out of legos or post its. Maybe a nice Picky Minch or Dr. Andonuts, the Runaway 5 and the mysterious keyboard player…. oh the possibilities. I’m gunna do this. For sure.